Manly Guys Doing Manly Things » A True Christmas Story. I was having a hard time coming up with a Christmas joke so I stole this line my dad used whenever people told him not to eat the gingerbread cookies the kindergarten kids gave him. Merry Christmas to you all! May your food coma be blissful and the drinks ever flowing. Poor Jared just got trolled. Just one look at their relative expressions tells a lot; Jared’s consternation compared to Rock’s bemusement. Definitely a direct shot straight through Jared’s ears & into the cranium. I hope he is taking small bites while Jared watches. …Adding a few yummy noises while he slowly chews. He’s a father, he’s been exposed to every germ that exists anyway. A father AND a super solder. He’s probably eaten things that would make Rambo puke. Your dad’s a braver man than me. Trust me, I’ve got no problem handling garbage and plumbing stuff with my bare hands, but when it comes to food, I get super squeamish. He never went to the Booger planet in Booger season – he hasn’t woken up drenched in booger with booger sliming through his laundry. He’s a father, of course he has. True enough. You raise any number of kids for any amount of time and your grossness threshold goes up substantially. Cleaning various amounts of poop and getting puked on in any capacity will do that. Projectile bowel movements will make anyone more tolerable to gross! Aw… that’s so cute. You’ve passed on your contribution to the great cycle of Dad-jokes. Merry Christmas CoelaSquid and all! Light a candle to drive away the darkness! Oh, and Jared’s Santa hat should have a little skull in the middle of the fuzzy band. Jared would appriciate the albino chibi squid a little bit more I guess. I have espoused similar sentiment regarding baked goods. Especially if the kids are watching. You don’t tell a kid that you aren’t going to eat the baked goods they made for you. Your stories about your dad always make him sound pretty great. Jared is a professional pokemon professor that revolutionized the field of feeding pets. I trust his judgement in treats. Dad Jokes are the best jokes. Especially when they’re about boogers. Can’t forget the ol’ “pull my finger” joke either. Very happy holidays to you, Coelasquid, and I love Commander’s beard!! My mum said that EXACT thing when we attended my 2yo nephew’s Lucia performance and there were baked goods on offer that I avoided like the plague. It must be some parental wisdom that comes to those that have procreated: Acceptance of disgustingness and knowledge of what kills off some of it. Oh wow I love Jared’s expression in the last panel. Happy Winterval, Coelasquid! Have a good one! 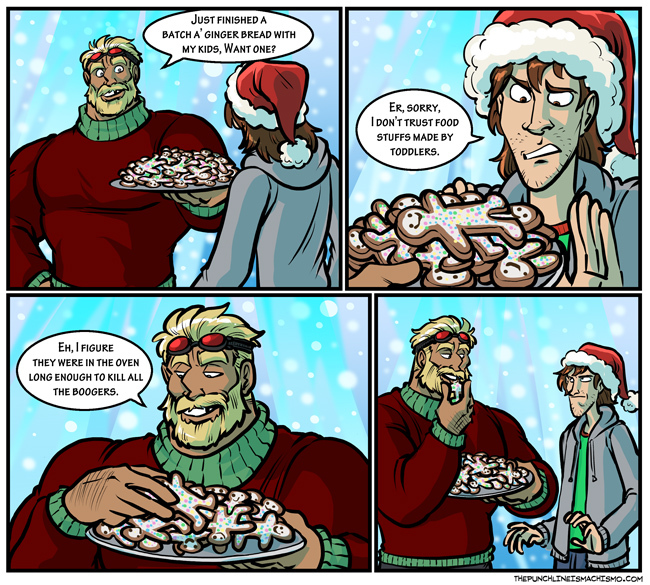 Merry Christmas Coleasquid and thank you for another year with one of my favourite comics. I have to say, I thought boogers was a cute name and that Commander was joking that he had baked children into the cookies. I like your other stuff… but I love Commander father stuff the most. He’s a good dad. Not just to the sprogs, but to Jared. Hey, uh, I don’t mean to complain, but since you might not be aware of this I thought I should say something. Your ad provider must be serving one of those scammy browser-hijacking malvertisements, because when I tried to read today’s comic on my phone I got forcibly redirected to a phishing page that said “Your [insert phone model] is compromised by 4 virus !! Click here to repair!” (and had a fake Google logo). You might want to look into that. That’ll be malware on whatever device you’re using, not a website issue. I recommend you look into a safe, secure antivirus option (like Avira) and be more careful about where you surf the web. Nope, I’m also seeing questionable ads like Super Nerd—though they just claim I won a car (yeah sure), that’s still the sort of ad I usually only see on questionable websites (not like this) or websites being tricked by their ad provider. And this is Chrome on iPad, so a bad ad is more likely than a virus. Little known fact, oven heat can kill all the boogers but not the cooties! Beware! As a father of a 6 year old. This pretty much sums it up. At this point you’ve dealt with much worse things than something that has been “sanitized” by heat. This doesn’t have much to do with this week’s comment, but I discovered that Lego has released a set that includes Lobo and his Space Hog (and unfortunately Krypto the Superdog as well). These look suspiciously restrained. I guess someone learned from the muffin incident. It’s South Park all over again…. If I learned anything from Meatwad, it’s that boogers make you immortal. Boogers are just another source of vitamins, proteins, and salt. I’m sure you have seen adults mining their nostrils when they are distracted. Oh lord, The Commander in that sweater and that beard, holding a plate of cookies, looking so domestic.